“What are the odds? 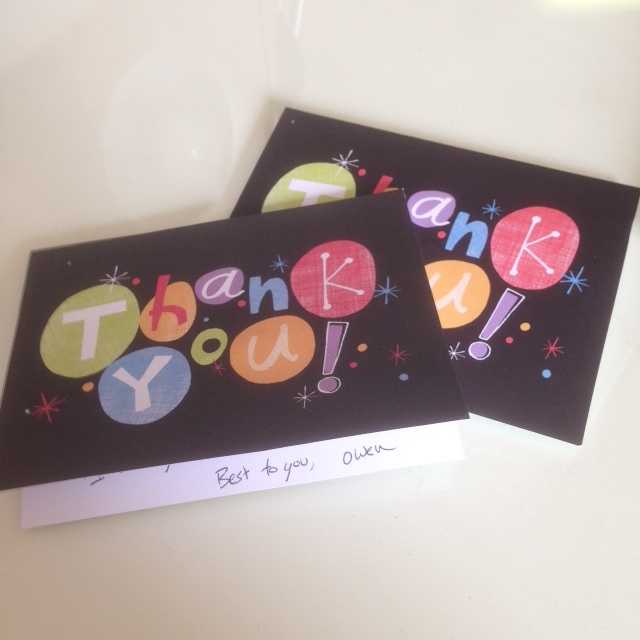 Not one, but here are two cards we received already this year from guys and were the same type of note cards. I hope American Greetings sees this and is thrilled! 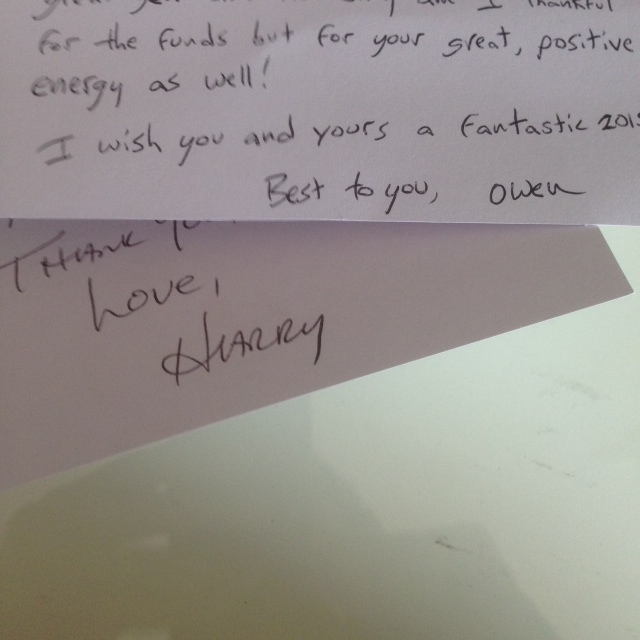 I received Owen’s card last month for donating to his Rally Me fundraiser for his windsurfing competitions (remember I mentioned loving sports in my last blog?). 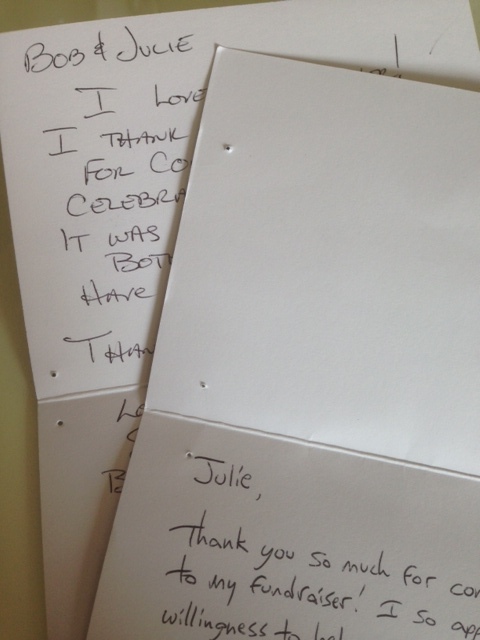 The greatest thing that was by donating $20, that was the perk–I’d receive a handwritten thank you note. I was beaming when I read that! The holes in the cards are because they have been up on my bulletin board. I don’t think I’ve ever had two cards at the same time like this and definitely not from two guys. Very cool! The other card is from a friend my husband has known for years. We attended his surprise party a few weeks ago and not only was I completely shocked to receive this handwritten note from him, but his writing was quite nice and I never expected it to look the way it did. Total judgment I guess, but I expected it to be sloppy. Ha! I’ll have to send him this link and hear his response. Being a former middle school science teacher I have a strange memory where if I run into a former student, I remember their writing more than their face or name. I’ll have to dig out some old letters from former students…someday. This morning I read this article, How a personal touch stands out in the digital age and even posted it onto a friend’s Facebook page. I’m all for emails, texts and twittering to and about others, but whether it’s a co-worker, boss, vendor, or customer, today’s businesses could still utilize sending a handwritten note. On the Facebook post I said, “I’m visualizing a nice flat note card with your name or business logo on it. I forgot to add that Embossed Graphics is my favorite for personalized stationery. Their partner websites Fine Stationery and Gifts in 24 have a great deal with free return address on envelopes that normally cost $29.99. 50 note cards for around $50 isn’t bad. I think they make a bold statement, so another reason to purchase if you have a need for personalized stationery. The card stock quality is medium paper weight and comes in a nice gold box. I have given men boxes of this stationery and they raved about how much they enjoy it, use and re-order! The verbiage about the banner card and bordered cards are not only worded perfectly, but are the ones I’ve purchased the most! I read this out loud to my husband and he thinks I’m crazy. I don’t think I’m crazy, just full of passion! This is exactly why I started this blog–to share my passion for keeping the art of hand-written letters alive! Next Do you save cards and letters?